Exacerbations of chronic obstructive pulmonary disease (COPD) are associated with significant morbidity and mortality . Current guidelines advocate the use of systemic corticosteroids in addition to antibiotics to treat an exacerbation [2, 3], but these treatments are not universally effective and are not without harm . Individualised treatment may, therefore, be an advance. Recently we showed that patients with a peripheral blood eosinophil count of ≥2% at the onset of an outpatient managed exacerbation respond promptly and completely to prednisolone, whereas those with a count of <2% had a higher rate of treatment failure compared with placebo . Whether these findings can be replicated in a larger population, including patients hospitalised with exacerbations of COPD remains unclear. We set out to address these questions in a further analysis of randomised controlled studies comparing outcomes in patients with exacerbations of COPD treated with prednisolone or non-prednisolone (placebo or equivalent). We investigated the rates of treatment failures in patients stratified by the peripheral blood eosinophil count measured at the time of exacerbation. A literature search of the Medline, EMBASE and PubMed databases was performed using the MeSH terms: 1) chronic obstructive pulmonary disease; 2) exacerbations; 3) oral corticosteroid/prednisolone; and 4) randomised clinical trials. Six trials fulfilled these criteria and the authors were contacted about data sharing. Of these studies, the peripheral blood eosinophil count at the onset of the exacerbation was only available in three randomised controlled trials comparing prednisolone or placebo (or equivalent) [5–7]. All entered subjects met the Global Initiative for Chronic Obstructive Lung Disease criteria for a diagnosis of COPD  and the Anthonisen criteria for an exacerbation . The primary outcome was the rate of treatment failures following treatment of an exacerbation, defined as retreatment, hospitalisation or death within 90 days of randomisation. Subjects were grouped according to treatment allocation (prednisolone or non-prednisolone) and blood eosinophil count (<2% or ≥2%) at the time of exacerbation and randomisation. The 2% threshold value is a sensitive marker of the presence of eosinophilic, corticosteroid responsive airway inflammation in patients studied at the onset of a COPD exacerbation . A severe exacerbation of COPD was defined as one that resulted in hospitalisation. The peripheral eosinophil count at randomisation was available in 243 subjects (160 males) from 300 captured exacerbations. Of these, 148 subjects (94 males) were randomised to treatment with 30–40 mg prednisolone daily for 10–14 days. The mean±sd age and smoking history at randomisation was 67±10 years and 51±32 pack-years, respectively. Of all the exacerbations 45% were associated with a blood eosinophil count ≥2%. One study , by design, did not include a placebo treatment in patients with a blood eosinophil count ≥2%, so in the overall population there were more biomarker positive exacerbations treated with prednisolone than with non-prednisolone (Chi-squared p<0.001). There were no differences in severity of exacerbation lung function impairment between subjects randomised to receive prednisolone or non-prednisolone therapy (forced expiratory volume in 1 s (FEV1) mean difference 0.03 L (95% CI -0.09–0.150 L), p=0.622; FEV1 % predicted mean difference 1.5% pred (95% CI -2.8–5.8% pred), p=0.496); or the proportion with severe hospitalised exacerbations (20% versus 25%, Chi-squared p=0.296). Overall there were 68 treatment failures (23% of all exacerbations); these occurred more frequently in patients with a severe exacerbation compared with those with a moderate exacerbation (45% versus 20%, p<0.001). The treatment failure rate was 66% in patients with a blood eosinophil count ≥2% who did not receive prednisolone and 11% in those who did (mean difference 55% (95% CI 38–73%), p<0.001) (fig. 1). 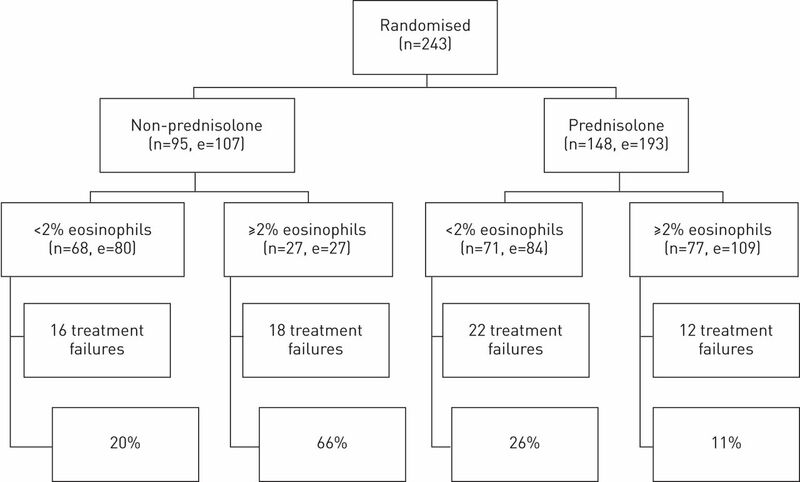 In patients with a blood eosinophil count <2% there was no difference in treatment failure rates with and without prednisolone (26% versus 20%; mean difference 6% (95% CI -9–27%), p=0.35) (fig. 1). The findings were not modified by severity of the exacerbation, baseline exacerbation lung function, age or smoking history. Consort figure for all analysed data taken from the three randomised control trials [5–7]. n: number of patients; e: number of exacerbations. This study shows that patients presenting with an acute exacerbation of COPD and a blood eosinophil count ≥2% have a significantly reduced treatment failure rate compared with those treated with placebo. The striking difference in outcome emphasises that, in the correct patient, corticosteroids have a large benefit. We found little evidence that prednisolone modified outcome or provided benefit in patients with a blood eosinophil count <2%. Our findings were not modified appreciably by age, severity of exacerbation, smoking history or lung function. Therefore, we conclude that a biomarker-directed corticosteroid treatment strategy using the peripheral blood eosinophil count measured at the onset of an exacerbation is a promising approach to maximise benefit and minimise harm. Several deficiencies of our analysis require discussion. In the studies by Bafadhel et al. and Aaron et al. antibiotics were given to all subjects at randomisation, whereas Davies et al. prescribed antibiotic therapy selectively according to sputum characteristics. This resulted in more patients with a blood eosinophil count of <2% at exacerbation receiving antibiotic therapy in the prednisolone arm compared with the non-prednisolone arm (74% versus 33%, respectively, p=0.033). It is possible that this resulted in a better outcome in the prednisolone treated group. In these studies, prednisolone was prescribed for a protracted course length, which has recently been shown to be noninferior to a shorter duration course . Patients in the study by Aaron et al. were randomised to treatment with prednisolone or etanercept (50 mg subcutaneous etanercept at day 0 and day 7). Overall etanercept did not modify treatment failure rates or influence other outcome measures and there was no evidence that there was a selective deleterious effect of etanercept in patients with a blood eosinophil count ≥2%, so it is unlikely that this was an important confounder. However, the use of non-standard antibiotic and immunomodulatory agents means that our findings should be regarded as hypothesis generating rather than definitive and clinically directive. Current guidelines advocate prednisolone treatment of exacerbations of COPD as placebo-controlled randomised trials show significant, but small, benefits [2, 3]. There is also a significant risk of adverse events . The findings of this study are potentially important as they suggest the considerable heterogeneity of the response to treatment can be minimised using a simple, readily available blood biomarker. Definitive studies comparing our current “one size fits all” approach to corticosteroid treatment to blood eosinophil directed therapy are thus urgently needed. Support statement: This report is independent research arising from a Post-Doctoral Fellowship held by M. Bafadhel supported by the National Institute for Health Research (grant number NIHR-PDF-2013-06-052). The views expressed in this publication are those of the authors and not necessarily those of the NHS, the National Institute for Health Research or the Department of Health.
. Systemic corticosteroids for acute exacerbations of chronic obstructive pulmonary disease. Cochrane Database Syst Rev 2009; 1: CD001288.
. Short-term vs conventional glucocorticoid therapy in acute exacerbations of chronic obstructive pulmonary disease: the REDUCE randomized clinical trial. JAMA 2013; 309: 2223–2231.
. Blood eosinophils to direct corticosteroid treatment of exacerbations of chronic obstructive pulmonary disease: a randomized placebo-controlled trial. Am J Respir Crit Care Med 2012; 186: 48–55.
. Oral corticosteroids in patients admitted to hospital with exacerbations of chronic obstructive pulmonary disease: a prospective randomised controlled trial. Lancet 1999; 354: 456–460.
. TNFα antagonists for acute exacerbations of COPD: a randomised double-blind controlled trial. Thorax 2013; 68: 142–148.
. Acute exacerbations of chronic obstructive pulmonary disease: identification of biologic clusters and their biomarkers. Am J Respir Crit Care Med 2011; 184: 662–671.